The artistic creation that is the Complex of Khajuraho is a representation of a highly original architecture. The mythological repertory features numerous scenes of amusement which are susceptible to various interpretations, which might be sacred or profane. Khajuraho was one of the capitals of the Chandella rulers of the Rajput dynasty. The dynasty came into power from the beginning of the 10th century. From 950 to 1050 the Chandella Ruler Empire reached its height. 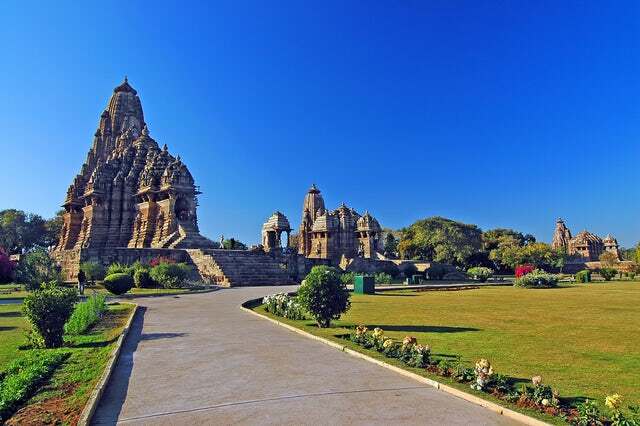 During this time, about 85 temples were constructed at Khajuraho during the Chandella period. The city was so grand that when Ibn Battuta noted the temples when he travelled there in 1335. Today, about 22 of the temples still exist. They occupy an area of 6 square kilometers. The temples and monuments found here come from 2 distinct religions – Brahmanism and Jainism. Their architecture is richly decorated buildings that are covered in sculpted panels which open to galleries. They are then crowned by a series of towers known as the Sikharas. Each of the towers is characteristic of the temples built in Nagera style and symbolizes the cosmic mountain – Mount Kailasha. The layout of the temples comprises of an entrance, a hypostyle hall, a dark sanctuary and several annexes. The Visvanatha, Parsvanatha and Vaidyanatha temples belong to the time of King Dhanga, the successor of Yasovarman. The Jagadambi, Chitragupta, which are noteworthy among the western group of royal temples of Khajuraho. There is probably no other place in the world that you can find as numerous temples from 2 major religions than in the complex of Khujaraho. Oh…and you are in luck. This destination, like many others in India, is very cheap.